Teaching shapes can be made simple if you take it one step at a time. For toddlers, repetition is the key to learning this spacial concept. Teach shapes in simple yet short lessons to help your child master this skill. Teach one shape at a time. Teaching several shapes all at once will only serve to confuse and frustrate a small child. Choose one shape, then… show two objects of the same shape to the child. Trace around each object with your index finger while saying the name of the shape. This helps children to understand the concept of shapes. Otherwise, you’ll have a child wondering why an object called a cookie yesterday… is called a circle today. Plan activities to help the child see the shape in everyday objects. Go on a shape search. Notice items in the child’s environment and point them out. For example: knobs, dials, buttons, steering wheels and tires are all circles. Make mealtimes a shape lesson. Have pancakes and sliced bananas for breakfast to reinforce the idea of circles. Mini sandwiches and apple bites (sandwich cut in fourths, apple cut into small square pieces) makes a great square lunch. Continue with the same shape until you are confident the child understands. Once several shapes have been learned, plan activities using more than one shape. Here’s five easy ways to reinforce what has been learned. 1. Place several objects of different shapes on the table. Try an orange, a block, a tortilla chip, an envelope etc. 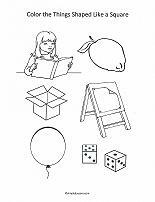 Name a shape and have your child identify which object corresponds to that particular shape. 2. Make cookies with assorted shape cookie cutters. Practice saying the names of shapes while baking and eating. 3. Use wooden shape puzzles found at any toy store. Buy the kind where each puzzle piece has a little handle so your child has an easier time getting the pieces in and out. 4. Cut several shapes out of assorted colored construction paper. 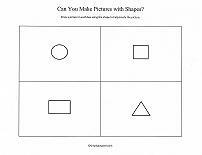 Have your child help you place the shapes on white paper to form a picture. Name the shapes as you create. A square with a triangle on top creates a house, a triangle with 2-3 circles on top makes an ice cream cone, and a rectangle with two circles forms a car. 5. Read picture books of shapes. 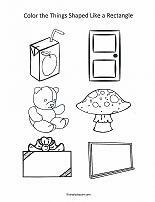 Find books with large bright pictures and your toddler will be able to point to the pictures and say the names of the shapes. For more reinforcement of lessons learned, here's some printables for added fun. 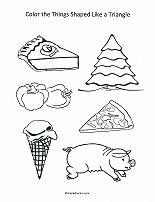 Start with coloring pages for assorted shapes. The object is to color only the pictures with the correct shape. There are coloring pages for circle, square, rectangle and triangle. Just click on the worksheet of your choice to open the PDF file for immediate printing. OR... 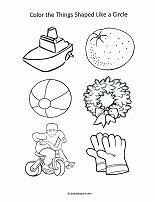 Try this simple print-out that will let kids use their imaginations to draw pictures using each of four shapes. 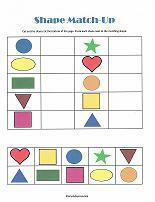 This worksheet works well once the kids have learned several shapes. Simply cut out the shapes at the bottom of the page and paste the shapes in the upper boxes to create matches. The most important thing to remember when teaching shapes is to make the lessons fun. Do not reprimand when mistakes are made. Praise all efforts and soon enough, your child will proudly be able to name all the shapes.